Traverse City Golf and Country Club, often described as “The Gem on the Hill,” has been part of the Traverse City, Michigan, community since 1915, serving as a place to play, relax and reconnect with friends. Traverse City Golf and Country Club, often described as “The Gem on the Hill,” has been part of the Traverse City, Michigan, community since 1915, serving as a place to play, relax and reconnect with friends. But keeping pace with the changing needs of golfers and their families over the years has required that the club and its management remain forward-thinking and ready to embrace the lifestyle changes of its members and the community. 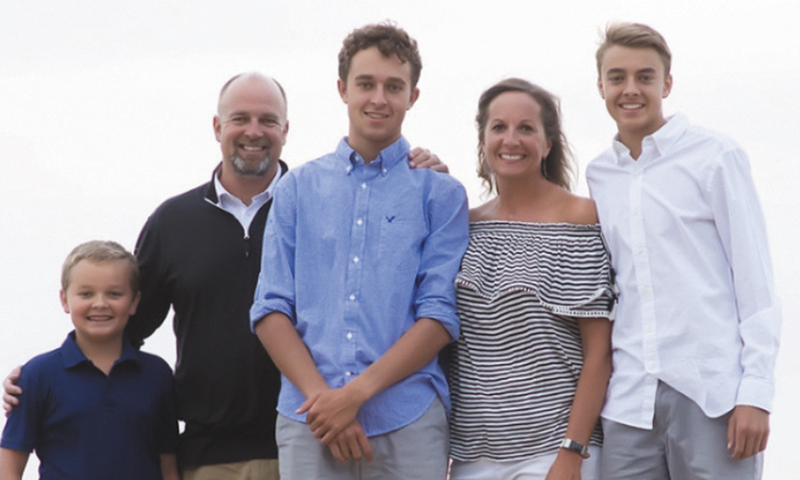 With deep-rooted family values of his own and a lifelong passion for the game of golf, Steve Hammon is ideally suited for his job of golf course superintendent at this popular facility. Although he’s logged more than twenty-two years as the superintendent at Traverse City Golf (TCG), Steve Hammon spent the first nine years of his golf maintenance career finetuning his skills at a diverse collection of facilities. Starting his winding career path in 1988, interning at The Springs Club in Palm Springs and then at PGA West in La Quinta, California, Steve returned home to Michigan in 1989, first as an assistant at Crystal Downs Country Club and later as the superintendent at Indianwood Golf and Country Club on the Old Course. During his years as an assistant, Steve wintered with crews in Fort Lauderdale, Florida, at Riviera Country Club in Nice, France, and at Cypress Point Club and Pebble Beach Golf Links in California. All along the way, this globetrotting superintendent added to the scope and depth of the knowledge he initially gained in the Turfgrass Management Program at Michigan State University. The wide range of skills and insights Steve acquired over the years has served him well at Traverse City, a course that has changed significantly over the two decades he has been there. The Gem on the Hill began as a 9-hole course with a rustic two-story clubhouse. With a second nine added in 1928, the club held its own through the Depression, largely with the help of its devoted membership. When a kitchen fire destroyed the clubhouse in 1957, club members again rolled with the challenge, quickly supporting construction of a bigger and better clubhouse. Over the years, Traverse City Golf has continued to update its facility. The club’s many upgrades include a 2006 expansion of its practice area. The team at TCG understood that by enticing players to an appealing practice area that replicated contours and greens found on the course, golfers would then take a better game to the course and potentially enjoy a better round of golf. As a standalone experience, a well-planned practice area provides an engaging venue for driving, putting and chipping, thereby allowing golfers to enjoy aspects of the game even when their schedule doesn’t permit them time to play a full round. Given that “growing the game” typically means lessons and practice on the range for beginners and juniors, a thoughtfully planned, maximized practice facility is an investment in a strong and stable future for a club. Today, junior golf thrives at TCG, thanks in part to Scott Hebert, PGA, Head Golf Professional. Hebert expanded junior golf from once a week to Friday mornings and Wednesday evenings. The mid-week evening timeslot quickly boomed with young golfers when the course targeted cocktail parties and dinners for the parents during the same hours. Thanks to the design of its range, the TCG team can, if needed, utilize the entire range like a mini executive course during junior outings. TCG has long been a social center in Traverse City, offering casual dining, fitness rooms, tennis and pickleball and seasonal cross-country skiing, snowshoeing and sledding. But this year, the management team once again embraced the challenge of delivering even more to its members. Current renovations underway include the construction of a pool complex, clubhouse renovations and course renovations. The pool complex will have a four-lane lap pool, an activity pool, a youth pool with zero entry and a 12-person hot tub. Within the pool building, a kitchen provides pool-area foodservice as well as serving as the course’s halfway house. With the pool house going up between the ninth green and the tenth tee, the ninth hole is, under the guidance of Renaissance Golf Design, being shortened from a par 4 to a par 3, a change that will also enhance the hole’s playability for most golfers. Sod taken from the ninth green was used to expand the eighth green, also under the design of Renaissance. To retain course par at 71, the second hole is gaining new back tees to take it from a par 3 to a challenging par 4. On the first tee, a new fitness facility is under construction to house expanded exercise and workout rooms, including fitness equipment and space for yoga, Pilates or the next trend in exercise. This building will also house two indoor golf simulators, along with the new pro shop. A new first tee and putting green will soon be under construction. And if you think all these changes sound like a lot to take on, consider the fact that the management team at TCG is driven to get these projects completed and ready for the members as quickly as possible. In fact, they are so determined, a heated tent was installed around the construction site ensuring that as long as the air temperature could be maintained at 32 degrees or higher, Shock-Crete can be poured for the pool, even in the dead of winter in northern Michigan. Through it all, Steve has actively participated in the renovations. “I have a really experienced crew,” Steve explained. “They are a great bunch of honest, hardworking family-focused individuals who’ve made my participation in this renovation possible. “While they manage and run the course, I can be involved in everything from A to Z, starting with finding out which features the members want most and then developing the plans for the best way to give it to them. The dedication and attention to detail demonstrated by Steve, and the entire hard-working team at Traverse City Golf and Country Club appears to be paying off by delivering exactly the features the club’s membership is looking to enjoy now and for many years ahead. Steve is a Past President of the Michigan Golf Course Superintendent Association and was a Committee Member of the Michigan Turfgrass Environmental Stewardship Program and a Green Section Committee Member of the United States Golf Association. Where did you go to school? I was fortunate to get into the Michigan State University program as a 19-year-old. I had one year with Dr. Ken Payne and then spent my second year during Dr. Trey Roger’s first year at MSU. What or who led or inspired you to become a superintendent? Bob Johnson and his brother Mike (Forest Hills Golf Course, now Watermark Country Club) were the ones that introduced me to the Turf Management Program at Michigan State University. Are you married, single or somewhere in-between? Married to my beautiful wife Sue, a 6th grade teacher in Frankfort, Michigan. Do you have children, and if so, how many? Three incredible sons, ages 19, 16 and 13. My oldest is a sophomore at The University of Michigan. What’s your favorite sport? College basketball. Go Green! How would you like to be remembered 100 years from now? I would like to be remembered as a loving husband to my wife Sue, an engaged father to my three boys and someone who gave back his time and skills to local organizations and groups. What is the most valuable thing you have learned in the golf course management profession? Never burn your bridges and to give back to your industry and community in any way you can. What’s the best round of golf you ever played and where? Back in 1993, I had the chance to take my dad to play Pine Valley Golf Club in New Jersey. We made a road trip out of it, down the Pennsylvania Turnpike. I don’t remember what I shot but sharing the time and the experience with him will always be a treasured memory. Next to golf what’s your favorite way to spend your free time? In the summer, I enjoy trying to keep up with my family’s non-stop activities, like going to the beach, bike rides and hikes, going out on the boat and enjoying so much time with friends and family. In the winter, for the past 12 years I’ve been coaching my boys’ basketball teams through their elementary school years. Recently, I just finished coaching my youngest son’s seventh grade junior high basketball team. Kids grow up so fast, you’ve got to make the most of every day and opportunity.